My parrot is an African Ringneck Parakeet (not an indian, but they're quite similar), I'm not quite sure how old he is but his ring is pretty black and thick with a pink nape. I got my parrot on the 24th. He is a very scared bird, but throughout the days he has started to get more comfortable and even began making cute shy little chirps when I would talk to him when I would wake up from naps. His cage is in my room, I'm almost ALWAYS in my room, so he spends A LOT of time with me. To explain a bit more about how scared he is, whenever I would put toys in his cage or try giving him treats, he would run away to a corner and try hurting himself. I'm guessing he's just really scared of hands. Well tonight I accidentally left his cage open and when I came back into my room he was on top of my tv. I tried sitting with him and waiting for him to come to me, but he ended up flying towards my dog. I quickly picked my dog up and ran outside of my room. We tried grabbing him, but he flew behind my dresser. I got my dads help and he was able to grab the parrot so that it wouldn't get hurt, but he bit my dad a few times. I feel really bad, because clearly this has pushed his progress backwards and it's all my fault. Is there any way I could regain his trust? I want him to be able to be outside of his cage, but he is scared of me and this has probably made it 1000x worse. Something else he was doing today (before the incident) was that he would hang on to the front of the cage and flap his wings. He is now sleeping at the bottom of his cage atm, is this because he is scared from what happened? I don't think he is sick, because he's been sleeping fine on his perches the last few days. He clearly wanted to fly. With mine I would let them out and let them fly until they got tired then they would step up to be helped back to cage. They can't see in the dark so you could have waited until dark and scooped him up. Grabbing him is supporting his idea that the giant in the room wants to catch and eat him. To him, you are a preditor. I am just the first to respond. Others with more knowledge will come on soon. Now, one thing you need to realize is that psittaculas [both the Indian Ringneck and the African ringneck as well as other species related to them are all psittaculas] are not companion parrots, they are aviary, so they never develop the kind of close bond that companion parrots have with their humans which makes it impossible for them to be actually happy in captivity unless they are with a bird companion or mate. But that doesn't mean that he cannot lose his fear of you and learn to trust you. For one thing, they need very large cages so make sure his cage is real big. It should be placed against a wall or have something [material] draped over the back [this is so he feels more secure in it]. He should also be kept at a strict solar schedule so I don't know how that can work out if he is in your room because unless you go to bed with the sunset, he will be exposed to light and noise [you mention a TV in the room] when he should be sleeping and that's not good for their health. We all want our birds to live with us and it would seem that our bedroom is the best place for them but, in reality, they are not. They need a room where they would not be bothered by people at night and where the level of humidity is as they need it [they need high humidity but people find it uncomfortable and our furniture gets ruined by it] and where an air purifier can run all winter long and where the air can be 'refreshened' all the time. He also needs a fresh food diet because these birds are mostly fruit eaters in the wild and require very little protein so you can't free-feed things like pellets or seeds to them [it would destroy his liver and kidneys]. I mention these things because health and being physically comfortable makes all the difference in mood [if one is not feeling well, one is not a 'happy camper' right?]. As to how to get him to stop being scared of you - well, first thing you have to do is make sure that his cage is high up so he is at your eye level when you are standing up, then you have to avoid staring at him and only put your hand in his cage when he is not in it. 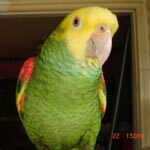 Parrots cannot spend their days in a cage, they need to come out for, at least, five hours a day to fly and/or move around so make sure your room is bird-proofed so there is nothing dangerous for him. And it's super easy to get them to go back into their cage if you feed them right because, if you do, he would only get seeds for dinner at night and he would be more than happy to go back into his cage for them -but, for them to be willing, they need to realize that they are going to come out again for hours and hours every single day because they would rather not eat than go back to 'jail' and who can blame them?! So, after you change his diet, let him out 2 hours before sunset and take away the food in his cage putting his dinner in about one hour after and wait for him to go back into it to eat them. He might not do it the first or second day but don't worry about it, once it's completely dark, you can go back in and very gently towel him and put him back in his cage. So start by making sure his diet and light schedule are the right one, that his cage is as he needs and placed just right and then spend hours and hours with him [not at night but during the day, preferably after he has his breakfast at dawn because that's when they are most receptive]. Don't walk or sit so close to him that he moves away, always stay at a distance where he feels comfortable [you can tell when he does because he will look relaxed and would preen, eat, drink, etc] and talk, sing, whistle to him and offer him a treat every now and then but, if he doesn't take it from your fingers, just leave it there for him to take when he feels like it and just walk away without even looking at him. You need to get him used to your presence before you can start getting him to trust and like you. Then, when you see that he is no longer scared of you, when he doesn't move away from you and actually moves closer to where you are, then you can start trying to establish a relationship with him. I do not watch TV at night. I try to keep my room as quiet as possible. And I have began to transition his diet from seeds to nutriberries. He is clipped, so he cant really fly that well. You are advising me to let him out and just wait for him to go back in?? Well, if he is clipped, he is even more scared than a normal bird because a clipped bird KNOWS it cannot get away from danger and this causes anxiety and stress so, please, do let his wings grow. He will thank you for it and you will have a healthier, happier and better adjusted bird and this means a bird that is easier to handle. He will not go back into his own cage on its own if you don't change his diet because it's the protein food that would motivate him but if he gets it all the time, there is no incentive, know what I mean? One: your parrot is in a new environment. Who wouldn't be scared or nervous in this situation? Adjustment will take some time. I spent weeks bonding with Chance at the bird shop before I took her home, meeting her in her former home prior before they sold her to the pet shop, where I found her later. My first meetings with Chance involved receiving the stink eye a lot before she started to slowly warm up to me. Try to initiate the first steps of bonding. Share a treat together. Eat with your parrot. Offer a treat (maybe some nuts or a mandarin orange) and eat it with the bird. Eating with your parrot is a bonding behavior and allows the bird to relax and feel more comfortable. Try soft music. I know it might sound silly but it actually works. Whistle along to the music or sing and encourage your bird to enjoy the music. Whenever I put music on Chance LOVES it. Music was one of our bonding behaviors, so try it with your bird.